In India, festivals arrive one after the other to keep us zesty and active! Come January, it is time for Makar Sankaranti in the North and Pongal in South India. These are spring festivals, enjoyed with lots of outdoor activities that keep us close to Nature and remind us of how closely we are bonded with our environment. Makar Sankaranti is a very popular festival in Uttar Pradesh, Rajasthan, Gujarat and Maharashtra. It is a community event that is very popular in cities like Jaipur and Varanasi, just like Calcutta is known for its Durga Puja. During Makar Sankaranti, kids and adults flock to the terrace and other open spaces with colourful kites. The sky is dotted with bright kites and the atmosphere is abuzz with the festive spirit. It is considered important to make sweets with peanuts, sesame seeds, coconut and jaggery during this festival, and usually chikki is the most popular sweet made with these ingredients. Varieties of chikkis are made in huge dabbas and shared with friends and relatives when they meet for the festival. Although chikki might be a blanket term that covers all of them, each tikki is unique in its flavour and texture. While Peanut Chikki has a crisp texture, the Dry Fruit Chikki combines the crunch of nuts with the chewiness of dried fruits. The Mixed Til Chikki has a unique mouth-feel and a classic flavour that has timeless appeal. The Kurmura Chikki with its puffy crispness is an all-time favourite with kids. The Til Laddu made with til and gud is a traditional recipe with an addictive flavour and aroma. In South India, Makar Sankaranti is celebrated in honour of the Sun, the life force that makes life possible on Earth. In Tamil Nadu, this festival is called Pongal, and farmers pay their obeisance to the Sun God, thank Him for a good harvest, and pray for the forthcoming agricultural cycle to be fruitful too. Freshly-harvested rice and vegetables are used to make traditional delicacies like Chakkra Pongal (Sweet Pongal), Ven Pongal (a savoury khichdi like dish) and Ezhukari Kootu (a spicy subzi with seven or more veggies and beans). The rice is usually cooked in new earthen pots. Huge, colourful rangolis are drawn on the courtyards, the earthen pot is placed in the centre of the rangoli on a wood-fired stove and the rice is cooked under the Sun. Although modern cooking methods are available, many households, especially in rural areas prefer to follow this traditional method till date. For lack of facilities, city-dwellers settle with cooking these delicacies on gas stoves and other appliances! 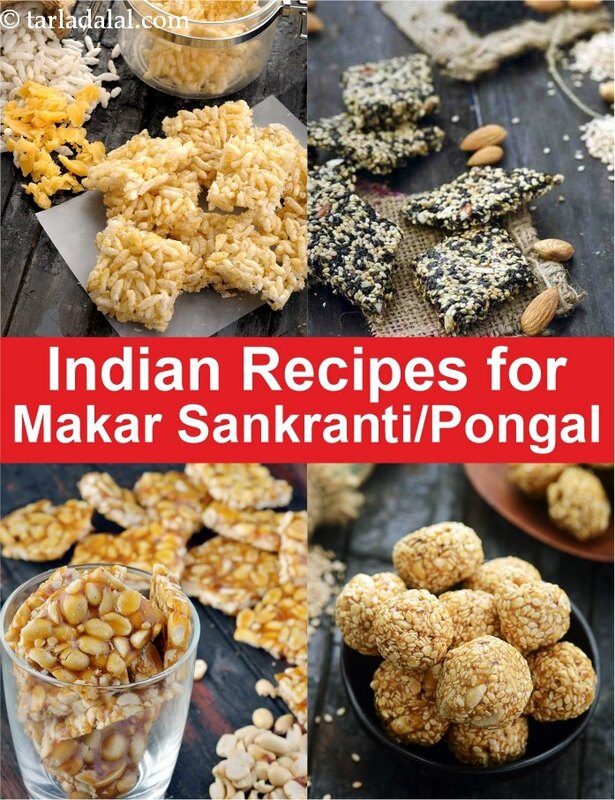 We share with you time-tested authentic recipes for making these dishes, to make Makar Sankaranti all the more special. Any festival is a time to celebrate with friends and family, and to keep traditions alive. Food being a part and parcel of our culture, it is also important to know how to cook and serve our traditional delicacies with love and care. We will always be by your side, helping you achieve the best outcome in the kitchen! Til laddo is a traditional mother's recipe to add calcium, iron and fiber in your diet. The til seeds, jaggery and ghee blend together in the laddo and is a tasty and healthy laddo( sweet ball) recipe. Andhra Pesarattu with ginger chutney makes for a lovely delicious and healthy breakfast combination. The pesarattu is prepared from a batter comprising of moong dal and is then served crispy hot with ginger pickle or chutney. Gulpapta comes straight from grandma's closet of healthy and tasty recipes. The gulpapata is made from a mix of flours which are roasted and then cooked with sugar, cardamom, chopped nuts and enjoyed shaped as balls.